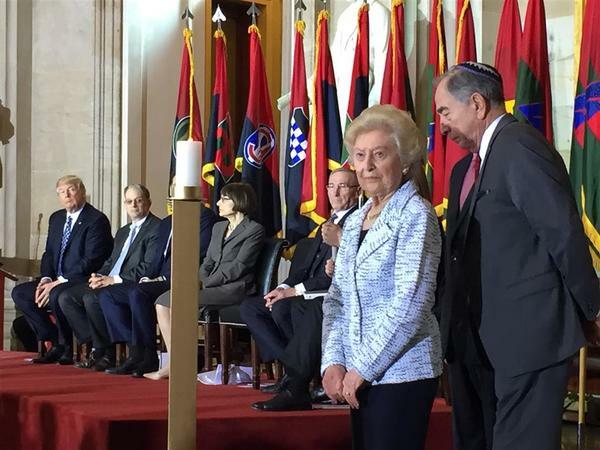 On Tuesday, I joined my mother Irene Weiss, a Holocaust survivor, at the U.S. Capitol Rotunda for the Days of Remembrance ceremony, the nation’s annual commemoration of the Holocaust. President Trump attended with Vice President Pence and other members of his administration, and gave the keynote address. My mother, together with U.S. Congressman David Kustoff, lit one of six candles to remember the six million Jews killed in the Shoah. NCSEJ CEO Mark Levin led a World Jewish Restitution Organization delegation to Riga, Latvia this week to meet with Latvian government and Jewish organizational representatives about issues of restitution. Members of the delegation included WJRO Washington Representative David Feinman and Elie Valk, Chair of the Association of Latvian and Estonian Jews in Israel. They were joined by U.S. Department of State Special Envoy for Holocaust Issues Thomas Yazdgerdi, and Dmitry Krupnikov, Deputy Chairman of the Latvian Council of Jewish Communities. U.S. Ambassador to Latvia Nancy Pettit hosted a coffee with WJRO and ambassadors from Europe and Israel to discuss the status of Holocaust restitution issues in Latvia. NCSEJ CEO Mark Levin also attended Latvia’s tenth “Jews in a Changing World” conference in Riga. This year, the conference celebrates Latvia’s centennial anniversary and the contribution of Jews to Latvia’s founding and development. The conference was organized by Latvia’s Council of Jewish Communities, the University of Latvia’s Center for Judaic Studies, and the Museum “Jews in Latvia.” Financial supporters include the Latvian government and the American Jewish Joint Distribution Committee (JDC). Earlier this week, NCSEJ leaders attended the quadrennial World Jewish Congress Plenary Assembly in New York City, the first U.S. city to host the Plenary Assembly in the organization’s 80-year history. The Plenary Assembly drew 800 Jewish leaders from diverse communities across six continents, with a substantial representation from Eastern Europe and Eurasia. NCSEJ CEO Mark Levin joined President Alexander Smukler and Vice-President Martin Goldstein at the conference, and Senior Program Officer David Shulman attended as a member of the Jewish Diplomatic Corps, WJC’s young leadership group. Finally, this week I participated in a small roundtable discussion with Lithuanian Prime Minister Andrius Kubilius, Vice Speaker of Lithuania’s Seimas (parliament) Gediminas Kirkilas, and members of Ukraine’s parliament, hosted by the Atlantic Council in Washington. Prime Minister Kubilius and Vice Speaker Kirkilas have authored A New European Plan for Ukraine, which addresses what Europe can do to support Ukraine as it faces security challenges stemming from the ongoing armed conflict in its eastern territory. Eastern European countries, in particular Poland, have failed to live up to their pledges to ensure the return of property taken from Jewish people during the second world war, a study has found. Eight years ago governments from 46 states promised in the so-called Terezin declaration to try to bring some justice to the victims of the mass thefts of the 1930s and 1940s, in recognition of the advancing age of Holocaust survivors. The U.S. special envoy for Holocaust issues urged Eastern European nations to honor their largely unimplemented promise from 2009 to offer restitution for property stolen from Jews. Thomas Yazdgerdi made the appeal at a high-level conference Wednesday in Brussels on restitution, where special attention was devoted to the 2009 Terezin Declaration. In that statement, many European countries for the first time vowed to resolve Holocaust-related property claims. Many of them, however, have not followed through. Over 2000 members of Moscow’s Jewish community came together for the largest-ever festival for Russian-speaking Jews in the former Soviet Union this past weekend. Keynote speakers included Russia’s chief rabbi, Berel Lazar and Israel’s minister of justice, Ayelet Shaked, who told the Moscow Jewish community that Israel “would be happy” if Russia moved its embassy to Jerusalem. The sign was put up a day earlier, while Israel was marking Holocaust Remembrance Day, and drew criticism from the chief rabbi of Ukraine, Moshe Azman, who posted pictures of the theater on his Facebook page. Prime Minister Volodymyr Groysman is scheduled to visit Israel in mid-May, a sign that Israel’s anger over Ukraine’s support for UN Security Council Resolution 2443 has subsided. Ukraine was among 14 countries that voted for the anti-settlement resolution in December, in the waning days of former US president Barack Obama’s term. The Americans enabled the passage of the resolution by abstaining on the vote, rather than vetoing it. Vice-Minister of Foreign Affairs Neris Germanas and other Lithuanian diplomats, together with thousands of Lithuanian citizens who care and wish to pay homage to the victims of the Holocaust, participated in the March of the Living in Paneriai on 26 April. It is a symbolic walk from Paneriai railway station to the memorial in Paneriai (Ponary) to honour the memory of 70 000 Jews and people of other nations killed there. The March of the Living was held in Vilnius for the tenth time this year. The years-long restoration of the Old Synagogue in Bardejov, Slovakia has been completed, bringing back to life the imposing synagogue that anchors the compound of ritual buildings known as the Jewish Suburbium, one of the few Jewish heritage sites on the UNESCO roster of world heritage. Three youths overturned and broke a number of headstones in a Jewish cemetery in Bucharest, police said on Tuesday, in an incident that drew condemnation from Romania's small Jewish community. The police said in a statement to state news agency Agerpres they had identified the youths, who were aged from 13 to 16, but had made no arrests pending a criminal investigation. Hungary’s $22 million Holocaust museum, whose construction was completed in 2015, has remained unopened due to intrigue within the government and disputes between it and the Jewish community, a news site reported. Part of the reason for the delay is the refusal of the Mazsihisz federation of Jewish communities and the Yad Vashem Holocaust museum in Jerusalem to cooperate with the House of Fates museum in Budapest, according to an expose published earlier this month by the news site 444. Two years have passed since Meir Bulka returned from a roots trip to Poland very angry, but the condition of the cemetery in Ostrowiec Swietokrzyski in southern Poland hasn’t faded from his memory. But at the local cemetery, where Jews had been buried since the 18th century, he was greeted by vandalized graves and piles of rocks that had once been gravestones. Despite his efforts, he was unable to locate even a single relative’s grave. The World Jewish Congress (WJC) Plenary Assembly passed several resolutions Tuesday dealing with major issues facing the Jewish world, including anti-Semitism, extremist political parties, the Middle East peace process, and combating hatred on the internet. The WJC’s supreme governing body met in the United States for the first time in the organization’s 80-year history. A member of the European monitoring mission in eastern Ukraine was killed and two others were injured Sunday when their vehicle drove over a mine near Luhansk. The Organization for Security and Cooperation in Europe, which runs the monitoring mission, said it was investigating. The monitor who was killed was an American man, according to a spokesman for the Foreign Ministry of Austria, which holds the rotating presidency of the 57-nation organization. The man’s name was not released. Ukraine cut electricity to parts of an eastern region controlled by pro-Russian separatists on Tuesday, citing unpaid debt - a step the Kremlin said amounted to a rejection by Kiev of breakaway territories. Three years after Moscow annexed the Crimean region, tensions between Ukraine and separatists in the Russian-held eastern part of the country remain high and a 2015 ceasefire is violated regularly. The European Union's top diplomat said on Monday that the bloc wanted better ties with Russia but could not pretend Moscow did not annex Ukraine's Crimea in 2014 and that EU sanctions would stay in place. Countries in Central Europe showed the largest relative increases in military spending in 2016, at least partially as a result of the perceived increased threat from Russia, a new study says. "The growth in spending by many countries in Central Europe can be partly attributed to the perception of Russia posing a greater threat," the Stockholm International Peace Research Institute (SIPRI) said in a report released on April 23. EU ambassadors have approved visa liberalization for Ukraine, a key step toward closer ties and visa-free travel to the EU for Ukrainians. EU ministers are now set to rubber-stamp the decision on May 11, and the signing ceremony for the deal is expected to take place in Strasbourg on May 17. The Russian government moved on Wednesday to defang efforts to stage antigovernment rallies this weekend by blacklisting the coordinator, Open Russia, an organization founded by the Kremlin critic Mikhail B. Khodorkovsky. Although the main organization is based in Britain, Russia’s prosecutor general labeled it “undesirable,” effectively making it illegal for the body to operate inside Russia. It cited the protest efforts as the main reason. With so much spin and counter-spin amidst the ongoing public relations war between Ukraine and Russia, with charges and counter-charges on anti-Semitism, not to mention accusations of all-out “fascism,” it’s important to step back and take stock of the reality on the ground. Recently, I had the opportunity to travel to Kyiv where I attended events organized in tandem with the 75th anniversary of the Babi Yar massacre, in which the Nazis and their Ukrainian allies murdered tens of thousands of Jews. Over the course of several conversations, local community leaders and experts expressed that the Jewish community was “well-integrated” into Ukrainian society, though unfortunately rightists remain a constant irritant and threaten to derail inter-ethnic understanding. My aunt recently reminded me that everything changed on April 26, 1986. I knew this, of course, but it wasn’t often that my family talked about the accident or the evacuation. When I was growing up in Brooklyn, my grandfather Mikhail spoke proudly of his work at a nuclear power plant, as well as of the house he built in the town in which he grew up, where he met and married my grandmother Mira, and where my father Slava and aunt Lena were born.